If you follow my blog more or less regularly, you will know that I love desserts that can be served in shooter glasses. Creamy desserts that can be eaten with a spoon have always been my weakness, and I love to serve them in smaller portions, especially as part of a buffet, so I can mix and match a few different colours and flavours. Today’s recipe is a classic Italian Lemon Meringue pie, served in shooters! 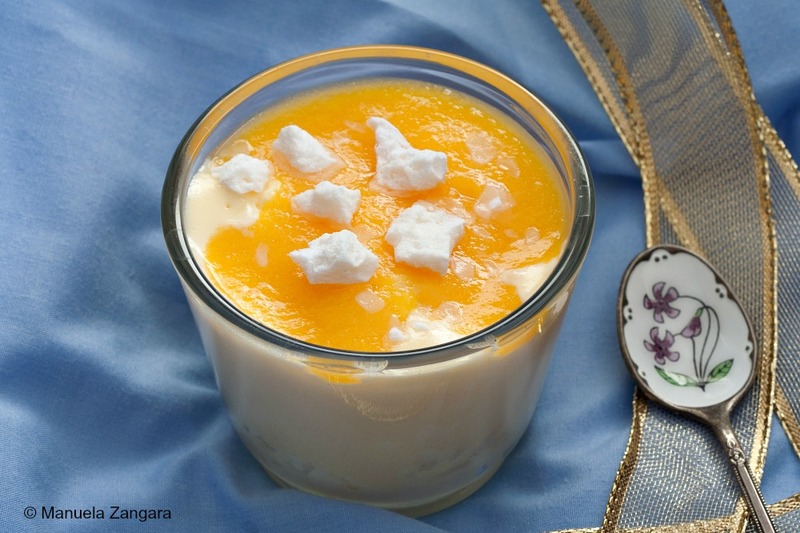 Top it with a delicious (and very easy to make) peach sauce, for the perfect spring dessert! 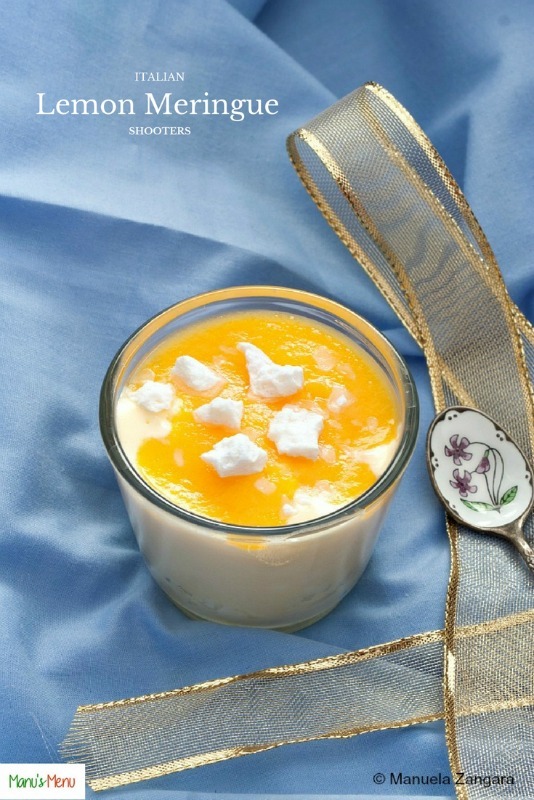 Italian Lemon Meringue Shooters - a classic Italian meringue pie, served in a shooter glass! The perfect spring dessert! 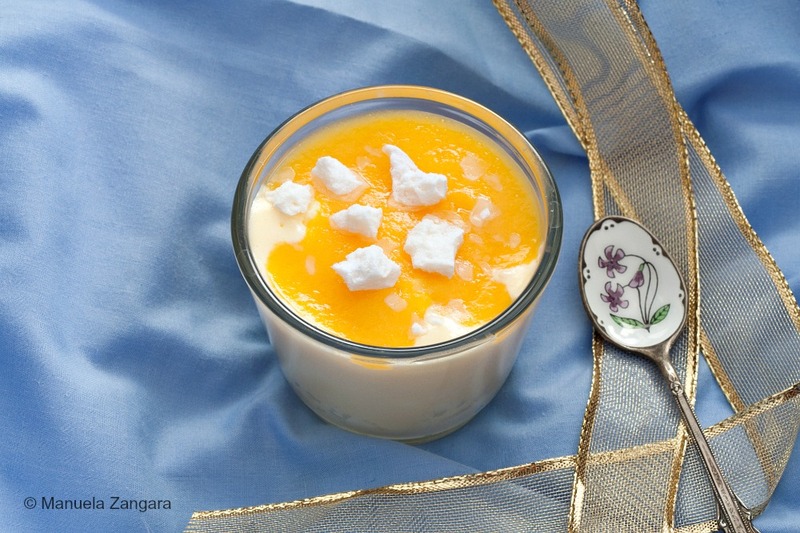 Put the egg yolks and 100 gms – 3.5 oz. 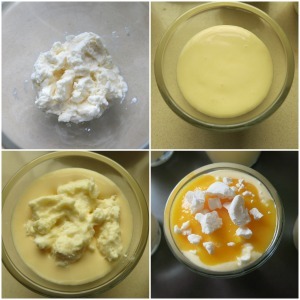 of sugar in a bowl and mix them with an electric mixer till they become creamy and almost white. In the meantime, squeeze the lemons and filter the juice (you have to obtain ½ a glass of filtered lemon juice). Add it to the yolk mixture together with the brandy and stir until combined. Put the egg yolk and lemon mixture in a sauce pan and cook it in a double boiler until it thickens and it lightly coats the back of a spoon. Set aside and let it cool down. In the meantime, whip the cream with the remaining sugar. When the lemon cream has cooled down, add half of the whipped cream to it and mix. Crumble the meringue in the remaining half whipped cream and mix. Put a layer of meringue cream at the bottom of the shooter glass and press it well. Now add a layer of lemon cream and so on. Finish with a layer of meringue cream. Put the shooters in the fridge to set for a few hours. For the peach sauce, just blend the peaches with their syrup and filter the sauce. Set aside and refrigerate. You can decorate it with extra crushed meringues. Serve it with the peach sauce on the top.